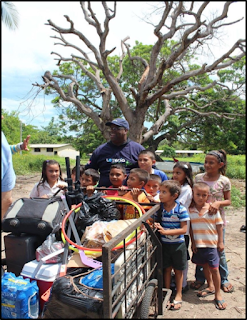 Dr. Clyde Rivers, was recently asked to visit El Salvador on behalf of their Lotto System. He was able to experience the great work the lottery is doing to help their small communities. They are providing resources to help create a better life for their people. Dr. Rivers was able to experience the joy and gratitude of the beautiful people of El Salvador. The lottery is looking to encourage and provide for the next generation through their endeavors. The leaders of the Lotto honored IChange Nations™ Founder and President Dr. Rivers during his stay in El Salvador. They recognized his heart for humanity and his humanitarian work around the world. They stated, “Dr. Rivers makes us feel we are not alone in this work.” Dr. Rivers has been invited to return to El Salvador and continue his labors with this great country to honor their work and the great people of El Salvador. Golden Rule World Peace Ambassador, Dr. Clyde Rivers, is the Founder and President of IChange Nations™ a professional institution that builds Statesmen by equipping, mentoring and training highly esteemed individuals who have the desire to change nations throughout the world. The organization is seeking to bring global awareness by strategically helping nations to educate, train and support the Nation Building Process designed to improve the dignity and betterment of human life. This international platform focuses on establishing effective relationships to help people understand the value of honor and basic human rights. IChange Nations™is the World’s Largest Honoring Network Establishing Cultures of Honor around the world. ICN has established a system that is bringing back honor to the world. They look to honor people at global, national, state and community levels that have made positive contributions in helping mankind. It is no wonder that Golden Rule Dialogue and honoring others are going hand-in-hand to change the world. Labels: Dr. Clyde Rivers, Drrivers Media, El Salvador Lotto, Golden Rule Dialogue, Golden Rule Intl., iChange Nations, Interfaith Peace-Building Initiative, Peace and Humanities, World's Largest Honoring System.